Meyer announced earlier this month that he would be stepping down as head coach of the Buckeyes after the Rose Bowl on January 1, and handing things off to Ryan Day—the assistant coordinator who took charge of the team after Meyer’s suspension earlier this season. Ohio State athletic director Gene Smith hinted during Meyer’s retirement press conference on December 4 that there were plans to keep the coach around campus in some capacity, but Meyer told NBC4's Jerod Smalley that the decision to commit to this new career path came only after he consulted his family, the school’s athletic director, and God. Yet, it seems that not once during those conversations did anyone make a strong enough argument for why it might be a bad idea to attach his name to such characteristics. 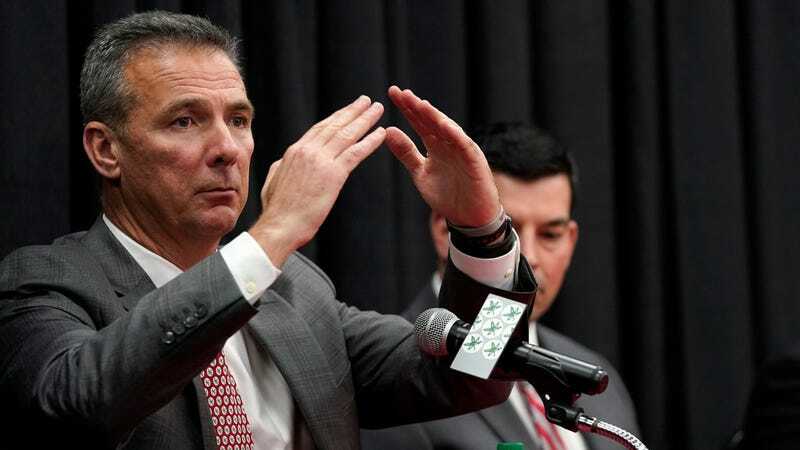 Seeing as he has some time before his class starts, maybe he should ask himself the following: What part of your character did you show when you left a souring Florida program for “health and family reasons” only to take an Ohio State job that had just opened up? What leadership skills did you demonstrate with how you chose to handle Zach Smith’s domestic violence allegations? Were either of those characteristics on display during the mental gymnastics portion of your apology tour a couple months ago? Hopefully he gets these things figured out soon because there’s nothing worse than a professor who doesn’t know anything about the subject he’s supposed to teach.